Thamil Ananthavinayagan joins JiC for this guest post on the UN Commission of Inquiry of Sri Lanka’s soon-to-be released report and the challenges in achieving justice and accountability. Thamil is PhD researcher at the Irish Centre for Human Rights at NUi Galway and where his work focuses on the UN Human Rights Council. In the concluding phases of their thirty-year civil war, Sri Lankan security forces and the Liberation Tigers of Tamil Eelam (LTTE) repeatedly committed mass atrocities. 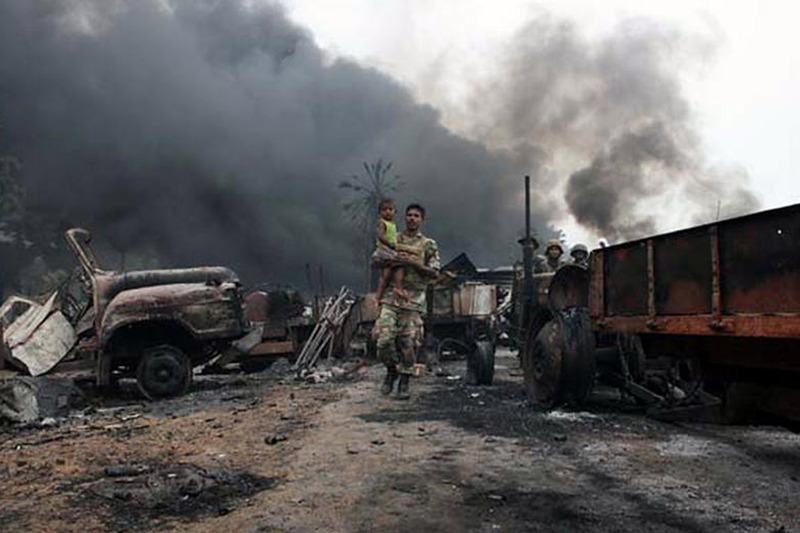 Although both sides had committed atrocities throughout the conflict, the scale and nature of violations radically worsened in the final five months that led up to the government’s declaration of victory in May 2009, resulting in the deaths of thousands of civilians and the displacement of more than 350,000 people. This post explores the consistent failure of the Sri Lankan government to adequately respond to these violations and points to recent developments that suggest how the tide may finally be beginning to turn. In light of mounting pressure for an international inquiry into alleged crimes committed during the civil war, in June 2010 Secretary-General Ban Ki-moon set up a Panel of Experts to advise on accountability issues relating to violations of international human rights and humanitarian law in the final stages of the Sri Lankan civil war. The Panel, whose members included Marzuki Darusman of Indonesia (chair), Yasmin Sooka of South Africa and Steven Ratner of the United States, identified credible reports that war crimes had been committed by both the Sri Lankan security forces and the LTTE during the conflict. Despite these conclusions, to date no credible domestic investigations have been initiated to examine the alleged commission of international crimes; similarly, there has been a notable lack of domestic efforts to prosecute suspects. Nonetheless, in the face of immense international pressure, the now-former Sri Lankan President, Mahinda Rajapaksa, did agree to appoint a Lessons Learnt and Reconciliation Commission (LLRC) which, in its final report, finally acknowledged that serious human rights violations had been committed. Yet, despite the LLRC making a number of valuable recommendations, the Sri Lankan government has failed to implement most of them. Moreover, the government has also refused to conduct any independent investigations into alleged war crimes, thereby fostering a broad culture of impunity for crimes committed during the civil war – and since. Against this background, the international human rights community decided to take action. In light of the idleness of the Sri Lankan government, a Commission of Inquiry on Sri Lanka was established by the United Nations Human Rights Council (UNHRC). The creation of the Commission was spearheaded by the United States and was in operation for a 10-month period beginning in mid-June 2014. It was staffed by 12 commissioners, including two forensic experts, a legal analyst, a gender specialist, and investigators. In the past, the UNHRC has established numerous commissions of inquiry and fact-finding missions covering a range of human rights crises, including Cote d’Ivoire, Syria, Lebanon, North Korea, and Gaza. These commissions are innovative vehicles, specifically designed to investigate urgent human rights situations; they are temporary, non-judicial mechanisms, crucial for promoting human rights, deterring future human rights violations and ensuring respect for the rule of law. One of the major challenges faced by any commission concerns impediments experienced by its members with respect to access and cooperation; lack of cooperation can include governments refusing to speak with or provide information to these bodies or refusing Commission members entry to a country or particular areas where the incidents under investigation allegedly took place. In the case of Sri Lanka, the government not only consistently refused to cooperate, but also waged a war of words on the Commission, branding its investigators unprofessional, selective and biased for refusing to divulge details of their witness interviews. UN High Commissioner for Human Rights, Zeid Ra’ad al-Hussein felt compelled to counter these allegations in an official statement, declaring with unaccustomed sharpness that the government of Sri Lanka had “refused point blank” to cooperate with the investigation, instead creating “a wall of fear” to deter people from submitting evidence to the commission. Change? The current and former Presidents are formerly close allies. 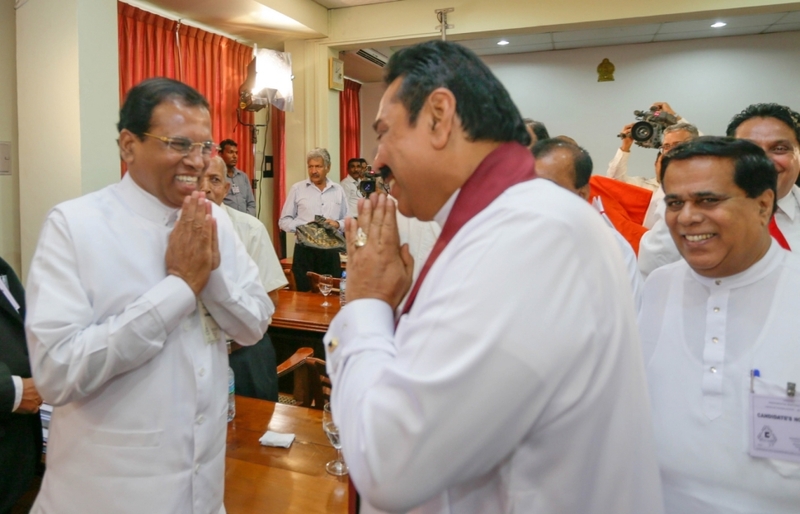 The Sri Lankan Presidential Election 2015: A Turning Point? In a surprise election outcome in early January 2015, voters shocked themselves by dismissing Mahinda Rajapaksa, whose administration had led the country to the brink of authoritarianism. The new president, Maithripala Sirisena, has promised to restore freedom of the press, independence of judges, and the rights of religious and ethnic minorities. Moreover, after weeks of intense lobbying by the new Sri Lankan government, the UNHRC has agreed to hold off its consideration of the long-awaited report of the Commission of inquiry until September 2015 as part of a “one time only” deferral in the words of UN Human Rights Commissioner Zeid Ra’ad Al Hussein. At the same time, the new President of Sri Lanka has indicated that his new administration will consult the United Nations concerning plans to set up a domestic inquiry into the worst crimes committed in the final stages of the war. This move has been received as both surprising and welcome, particularly given the bitter encounters that had marked the previous administration in Sri Lanka. However, Sri Lanka is going to face tremendous challenges and also hindrances: firstly, one should not ignore that the political elite is -despite all assurances- interdependent and interwoven. Mr. Sirisena was acting defence minister during the last stages of the war. This gives rise to the question if the people of Sri Lanka can expect impartiality and genuine conduct of war crimes investigation. One should also not ignore the strong support Mr. Rajapakse is enjoying among politicians and the rural Sinhala voters. Secondly, Sri Lanka is still a polarized nation, where Sinhala nationalism is still on the rise; the majority of the Sri Lankan political and social elite is Sinhala, while the minorities are left as social outcasts. Reconciliation is key for making the country a united nation, rather than a nation of communities. After years of erosion of the rule of law, a proper investigation into the alleged war crimes can establish confidence and set the first steps towards true reconciliation. The question will therefore be if the current administration will carry out war crimes investigations that lead to prosecutions that might also affect themselves – if that is the case, the people of Sri Lanka will genuinely embrace reconciliation. Long-term stability and post-war reconciliation can only be achieved through utmost respect, protection and promotion of human rights. Such a commitment needs to be achieved through organic changes in the domestic setting, avoiding a managerial approach that serves only to deflect human rights criticism on the international stage. In this vein, the new government must concentrate on engaging with the United Nations and adopt an approach that seeks to strengthen ties and promote the transfer of knowledge in the field of human rights, rather than maintaining the status quo and pursuing only cosmetic changes as was the practice of the previous administration. Reconciliation needs to be achieved through genuine justice, creation the rule of law and the absence of political and ethnic favoritism. Current moves by the government, namely the arrest of the former Sri Lankan minister and brother of the former President, Basil Rajapakse, but also the resinstatement of the Supreme Court Judge Bandaranayake give reasons for hope that the government is indeed genuine to seek for the rule of law. But is the government of Sri Lanka ready to address truth and justice in relation to the latter stages of the war? The grievances of affected communities across Sri Lanka need to be identified despite political obstacles – a genuine dialogue must be launched where victims, families and affected communities are given a platform to express their grievances. The commission of inquiry on Sri Lanka has already proven its capacity to induce behavioural change: it is an international human rights vehicle equipped to compel domestic human rights enforcement. The new administration’s approach to addressing the previous government’s failures on post-war accountability has won Sri Lanka more time, but the government must now deliver on its promises or risk tarnishing the country’s reputation further. Santayana’s words at the beginning of this post therefore reverberate: while only the dead have seen the end of the war, the echo of the final death throes shall not become a melody for impunity and collective amnesia. Instead, their deaths shall be a memorial for the quest for justice and protection of human rights – anywhere and anytime. This entry was posted in Guest Posts, Sri Lanka, UN Commission of Inquiry on Sri Lanka and tagged Mahinda Rajapaksa, Maithripala Sirisena, Thamil Ananthavinayagan. Bookmark the permalink. Reblogged this on MR DESHH.